Greg Egan and I came up with this formula last weekend. It’s probably not new, and it certainly wouldn’t surprise experts, but it’s still fun coming up with a formula like this. Let me explain how we did it. History has a fractal texture. It’s not exactly self-similar, but the closer you look at any incident, the more fine-grained detail you see. The simplified stories we learn about the history of math and physics in school are like blurry pictures of the Mandelbrot set. You can see the overall shape, but the really exciting stuff is hidden. François Viète is a French mathematician who doesn’t show up in those simplified stories. He studied law at Poitiers, graduating in 1559. He began his career as an attorney at a quite high level, with cases involving the widow of King Francis I of France and also Mary, Queen of Scots. But his true interest was always mathematics. A friend said he could think about a single question for up to three days, his elbow on the desk, feeding himself without changing position. Nonetheless, he was highly successful in law. By 1590 he was working for King Henry IV. The king admired his mathematical talents, and Viète soon confirmed his worth by cracking a Spanish cipher, thus allowing the French to read all the Spanish communications they were able to obtain. This is remarkable! First of all, it looks cool. Second, it’s the earliest known example of an infinite product in mathematics. Third, it’s the earliest known formula for the exact value of pi. In fact, it seems to be the earliest formula representing a number as the result of an infinite process rather than of a finite calculation! So, Viète’s formula has been called the beginning of analysis. In his article “The life of pi”, Jonathan Borwein went even further and called Viète’s formula “the dawn of modern mathematics”. by approximating the circumference of a circle using a regular 96-gon. 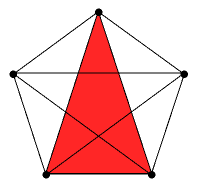 Since , you can draw a regular 96-gon with ruler and compass by taking an equilateral triangle and bisecting its edges to get a hexagon, bisecting the edges of that to get a 12-gon, and so on up to 96. In a more modern way of thinking, you can figure out everything you need to know by starting with the angle and using half-angle formulas 4 times to work out the sine or cosine of . And indeed, before Viète came along, Ludolph van Ceulen had computed pi to 35 digits using a regular polygon with sides! So Viète’s daring new idea was to give an exact formula for pi that involved an infinite process. Now let’s see in detail how Viète’s formula works. Since there’s no need to start with a square, we might as well start with a regular n-gon inscribed in the circle and repeatedly bisect its sides, getting better and better approximations to pi. If we start with a pentagon, we’ll get a formula for pi that involves the golden ratio! where we start with the area of the n-gon and keep ‘correcting’ it to get the area of the 2n-gon, the 4n-gon, the 8n-gon and so on. Again this is easy and fun to show. Puzzle 1. 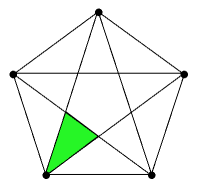 We’ve gotten formulas for pi starting from a square or a regular pentagon. 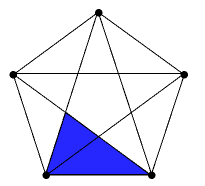 What formula do you get starting from an equilateral triangle? Conversely, use Euler’s formula to prove the generalized Viète formula. So, one might say that the real point of Viète’s formula, and its generalized version, is not any special property of pi, but Euler’s formula. This entry was posted on Tuesday, March 7th, 2017 at 4:47 pm and is filed under mathematics. You can follow any responses to this entry through the RSS 2.0 feed. You can leave a response, or trackback from your own site. Congratulations!, Very interesting presentation of ideas, these is one of most favourites too, other is Sequence Limits of Euler and Fibonacci Numbers and the golden section in nature, art, geometry, architecture, music and even for calculating pi! was sometimes called “Ludolph’s number” for a while. The Golden Ratio is often used as the numerical value for the aspect ratio (Y Axis Height/ X Axis length) when graphing functions. Doesn’t work for the cycloid and it’s variants. The aspect ratio for the cycloid, a ‘wheel function’ must be set to Y = 1 / X = pi. Failing to do so locates the inflection point of Roberval’s ‘companion curve to the cycloid’ away from the center of the bounding rectangle. that first in puzzle 2 is bothering me; it has zeros that the other side doesn’t. I’m pretty sure that first in puzzle 2 is a typo, and not actually part of Euler’s formula. Thanks for catching that mistake! Fixed. I knew something looked funny about that. I’ll fix it. Thanks! Wow, amazing! This time it’s really fixed. In my defense, to write “Voilà” here I actually type “Voil&agrave;”, and that makes it a bit easier to screw up. • John Baez, The Riemann zeta function, 21 December 2003. • Wikipedia, Weierstrass factorization theorem. except in the Wikipedia article on Vieète’s formula, so I’m a bit curious about its history. I guess it isn’t so surprising that Carr gives this proof but it’s fun to think about how much it would have delighted Ramanujan. BTW, I first learned about Ramanujan from your lecture about the number 5, so thanks for that. Thanks for telling me about Carr’s work! I’m a little late to this party. Neat! Another way of proving the identity in Puzzle 2 would be to use the Weierstrass infinite product formula for the sine and combine that with to get the infinite product for . With that, the Puzzle 2 identity basically follows from the fact that any integer has a unique representation as a power of 2 times an odd number (how it follows could be left as a puzzle). I will need to go through that sometime. People keep telling me about it, but I haven’t checked out the calculation! By doing a calculation in a sufficiently complicated way you can relate it to almost anything, so the question is how elegantly they make the connection. Th only step I couldn’t immediately replicate was the expectation of the Hamiltonian and I have never got back to it – the rest is correct. I must do it but it is 40 years since I did that stuff. You’re right, I got them switched. Earlier, when I actually used them, I had ’em right. I am thinking that it would be possible to write a pi calculus with a volume of a sphere, but the problem is with the polyhedrons that must be ever increasingly smaller (it is impossible to have more of five regular polyhedra, so that a generalization of Viete in three dimension is not possible). I tried to generate a general irregular polyhedra using a Bravais lattice on the sphere (for increase the faces of the polyhedron reducing the primitive vectors), with the discrete translations replaced with the versors for the rotation along the edge of the spherical triangles, and I have used the Rodrigues rotation formula to obtain the points on the sphere (with a little program), so that there are an infinite number of tessellation using an arbitrary initial spherical triangle (that generate the primitive vectors of Bravais lattice) with a vertex in the zenit, an edge along a meridian, and the other edge with an arbitrary lengths and directions (to complete the scalene triangle): the edges of the triangles have different lengths in the primitive vectors, but have the same rotations in the primitive vectors; the volumes of the polyhedron are too complex to evaluate, but it seem that it is possible to obtain the tetrahedron, the octahedron and the cube using the Bravais lattice (so that could be possible for all the regular polyhedra). Perhaps archemedian solids would be of use in this investigation. Hi, Akira. Thanks! I haven’t actually worked out the answer to Puzzle 1, but I’ll check your answer and see if it’s right. It’s certainly pretty. Also thanks for catching that typo. I fixed it. But these extra tricks are not very important! John I read many of your Maths/physics papers and always take time for Azimuth in/email. I sent you a series of polyhedrons, one I described as a tesseract or hypercube, a 3D icosahedral/cuboid construct yielding eight tetrahedrons. My working background is in building science, I’m a serious amateur mathematician with an emphasis on greenhouse and climate impacts, and number theory. its sometimes a bit awkward to explain but bricks, curvature and modularities are my areas of focused interest. The PI : PHI golden section relationship in 3D solids is an example I find fascinating, and the maths reasoning is why I follow Azimuth to connect the environment with pure maths and physics. A relationship between Phi and Pi; phi brick in ball, the brick in a sphere shows a simple relationship between Pi and Phi, using the values for the diagonal D that we have just found and the surface area S.
I should try to figure out whether the formula for n always agrees with the formula for kn (which it should), and why the algebra works out; it seems like it must be a beautiful pattern. I don’t think the formula for n will agree with that for kn unless k is a power of 2. Sure, it works. To check for , use . Only, the square root of is taken to be the positive square root, so it’s . Then , so it checks out. One possible reason for preferring Michael’s expression (haven’t checked this carefully; just a gut feeling) is that you get quicker convergence than with John’s preferred formula. According to Wikipedia, the first infinite series recorded was indeed an estimate of Pi, but it was of Archimedes, in the third century BC. When we make a logistic map indicating bifurcation leading to chaos, the number of nodes at each step together form a Fibonacci sequence and as this leads to the golden ratio phi… we can physically interpret this to the mean radius of the KAM tori representing the conditionally periodic process of the system under question whose phase space contain the tori. This is a possible interpretation of your formula Prof. John Baez. Thank you for this post, I feel like I learnt alot in a relatively short space of time. Never knew about Viete’s geometric formula, I associate Viete with the formulae relating roots of polynomials to coefficient. While it’s true that the golden number is a special case, the way it enters into the formula i.e. cos(pi/5)=phi/2 is elegant. This relates a simple trig function of pi with phi, and indeed a simple trig function can be related to a simple shape like a regular pentagon (and vice versa). The golden number is a simple expression in terms of a radical [sqrt(5)] unlike pi; in this sense pi is the greater enigma. The open question is: what other elegant ways are there of proving this connection? Im not a mathematician but need help with this please, anybody? I saw this video about how if we draw a spiral from a circle to a bigger circle in the ration of 1.68, then the LENGTH of that spiral is pi itself. The maker of this video doesn’t have any contact. Can someone please confirm this?? And if yes, what is the unit of measuring the 3.14?? It’s correct, and mildly amusing, but not terribly interesting to a mathematician. The YouTube comment by Linus Brendel from 2 years ago is exactly right. The narrator (who oddly pronounces it “Fibonicci” and not “Fibonacci”, and who obscurely refers to “cubes”) is adding up lengths of just six quarter-circle arcs to get from A to B. The length of the largest quarter circle arc is , and each successive arc has the length of the previous. So the claim is that . A good high school mathematics student, given some time, can prove that with a little algebra and knowing that . What about for the 17-gon, using Gauss’s formula? That case is left as an exercise for the reader, along with the 257-gon and 65537-gon. Although it was known to Gauss by 1801 that the regular 65537-gon was constructible, the first explicit construction of a regular 65537-gon was given by Johann Gustav Hermes (1894). The construction is very complex; Hermes spent 10 years completing the 200-page manuscript. and this formula is probably the most elegant distillation of what’s going on.